The New Zealand economy has been one of the stars in 2013 of the global developed economies and in 2014, it looks likely that trend is set to continue. As of today, the latest CPI data was released, and with it came renewed pressure on the AUD/NZD cross as it felt the pinch after a brief respite in recent days. The CPI data itself is important, as consensus was for a -0.2% drop for the last quarter of 2013 among prominent economists. However, as of this morning, the CPI data was recorded at +0.1%, helping to push the year’s inflation to +1.6%: well within the reserve bank’s 1-3% target range for maintaining inflation. This, in turn, leads to the pressure being placed on the Reserve Bank of New Zealand (RBNZ) which so far has been hesitant to push rates up any higher. However, with the recent inflation data, it looks likely the RBNZ will have to get aggressive to keep things in check. Attention will now certainly be placed on the next interest rate meeting of the RBNZ; which is on the 30th of Janurary, as major economists in New Zealand are now expecting a rate hike if not in this month but certainly in February. The resulting impact has seen major gains for all the NZ crosses, from the NZDUSD to NZDJPY. However, the main focus lately has certainly been on the AUDNZD, which continues to get pummeled and people are predicting to even go further, especially given the talk of aggressive RBNZ action after today's inflation data. The AUDNZD has trended lower after today's announcement and to be honest, it does not look likely to stop; given the aggressive nature of the bearish trend line, coupled with the fact that so many investors are now aggressively trying to push it lower. Furthermore, the Reserve Bank of Australia wants an 85 cent AUDUSD, and this is still a few cents off and if anything, the RBA could even be tempted into a rate cut just to help push things lower if need be to help restart the Australian economy. The technical aspect of the AUDNZD certainly shows that it has not touched historic support levels just yet, with the nearest sitting at 1.0501. This support level has not been touched since 2005, and it will be interesting to see if markets look to use it or push lower as it searches for more historic lows. The RSI is also showing aggressive as it looks to sit just on the 30 mark. This mark though is keeping downside progression slow, but still it shows that the selling of the AUD is extremely strong; given the extent of many times it has touched in recent months. 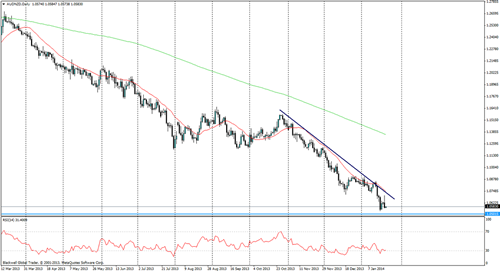 Overall, the AUDNZD is still a strong opportunity for traders. With the AUD still not low enough for the RBA, and the prospect of a rate hike by the RBNZ – certainly, big movements are still at hand for the pair.